- Please remove the insulating film first before using. - Please use the screwdriver to open the battery case before changing the new batteries. - Only the wire is waterproof, the cork isn't, so please keep it away from water. - Wine bottle string lights is creative idea for any decorative project ,but not use it as an illuminating light. ROMANTIC EFFECT & RECYCLE BOTTLES: Special cork shape for DIY most bottle lights. Create a romantic atmosphere, ideal for table, room, patio, wedding, party, Christmas, New Year and other festival decoration. UNIVERSAL CORK SHAPE: The size fits most bottles. Cork diameter: 0.65 inch to 0.9 inch, fit most wine bottles, whiskey bottles, beer bottles and other bottles. 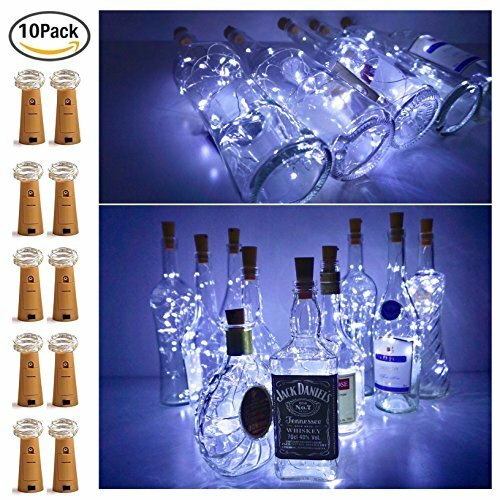 HIGH QUALITY : 20 LED more bright than 10 LED,Cool white more pure than warm white.All copper wires are bendable and flexible, you can make any shape you like or warp on bottle easily. Pull out the insulation strip, put the light strings into bottles, and switch the button to turn on/off the light. SAFE BATTERY OPERATED: Powered by 3 LR44 batteries, it can provide up to 20 hours of light by three new batteries. Best power-saving string lights will give you a fascinate in new lights world. WARRANTY: We offer 1-Year quality guarantee. If you have any quality problems, please feel free to contact the seller directly. Please note that our proucts have 10pack in per box and 20 mini lights in per cork bottle lights,not 20pack. If you have any questions about this product by Ninight, contact us by completing and submitting the form below. If you are looking for a specif part number, please include it with your message.